We scored some awesome finds yesterday at the Helping Hands Closing sale. I am really bummed that Helping Hands is closing because it was my favorite thrift store and it definitely had the best prices in town. 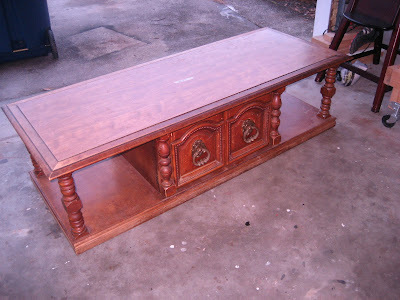 Here is what Lindsay's gorgeous coffee table looks like. My plans are to paint the table black and then distress it! We already have almost everything primed and we are just waiting for it to dry! Awesome! 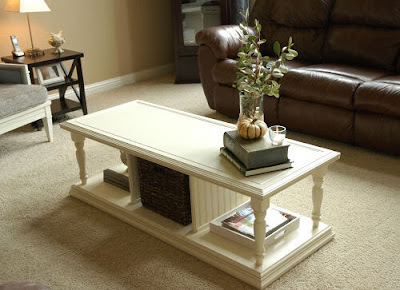 I love the coffee table change. When I first saw it I thought.....interesting! But the white one is awesome! What an eye! Round tables always seat more, which is nice. I can't believe you've already started the projects! You two crack me up.....and I love it! So is Helping Hands totally closed now? I actually thought they had closed for good back in Dec. 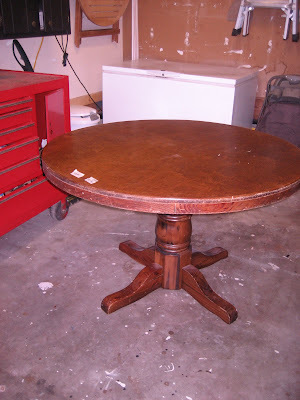 I love pedestal tables - painted it will be very 'up-to-date'. $15 is a great price! Great finds. The table is a steal. We have a very similar table that I painted black and love it.